George Cooper scored twice for Posh against Oxford. 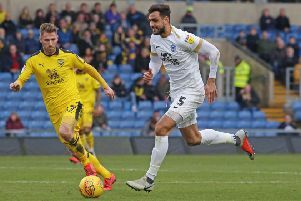 Peterborough United manager Steve Evans has urged the club’s fans to pack out the ABAX Stadium for Saturday’s League One top-of-the-table clash with Portsmouth (September 15). Pompey are one of the best-supported clubs in the division and have already sold over 2,000 tickets for Saturday’s match. The away fans have been allocated the entire Motorpoint Stand. They currently have an allocation of 3,600 tickets for a game that became an all-ticket match yesterday (September 10). Ivan Toney scored twice for Posh against Oxford. It’s sure to be a terrific atmosphere as table-topping Posh take on second-placed Pompey in a clash between two unbeaten teams. Posh are currently two points clear at the top. “Portsmouth have a fantastic fanbase,” Evans said. “They pack out Fratton Park every week and they travel in huge numbers. Tickets are available online at www.theposhtickets.com, from the Ticketmaster hotline 0844 847 1934 and in person at the ABAX Stadium Box Office (open from 9am until 5pm through this week). Posh fans who hold a 12-game Flexi-Ticket are advised to confirm Saturday’s game as soon as possible to secure a ticket. Fans can purchase Flexi-Tickets at www.theposhtickets.com saving up to £7 on match day pricing. Season ticket holders are also able to bring a friend to a game for just a tenner twice a season. Further details can be found on www.theposh.com. A strong Posh reserves side beat Oxford under 23s 5-1 in a behind-closed-doors friendly at the ABAX yesterday. Ivan Toney and George Cooper both scored twice with Matt Stevens also on target. Toney, Cooper and Jamie Walker were all outstanding according to Evans.